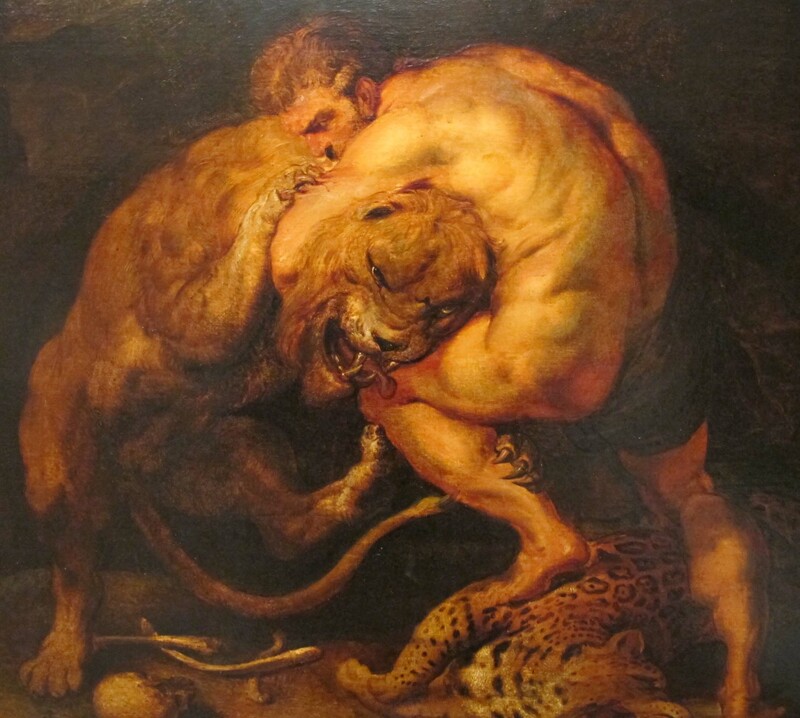 The first of Heracles’ twelve labours, set by King Eurystheus (his cousin) was to slay the invincible Nemean lion which roamed the hills of Nemea, terrorising the population. Setting out on such a seemingly impossible labour Heracles wandered the area until he came to the town of Cleonae. There he met a poor workman-for-hire by the name of Molochorus who said that if Heracles slew the Nemean lion and returned alive within 30 days, the town would sacrifice an animal to Zeus; but if Heracles died trying to kill the animal, Molochorus would instead sacrifice to Heracles in recognition of his bravery and heroism. 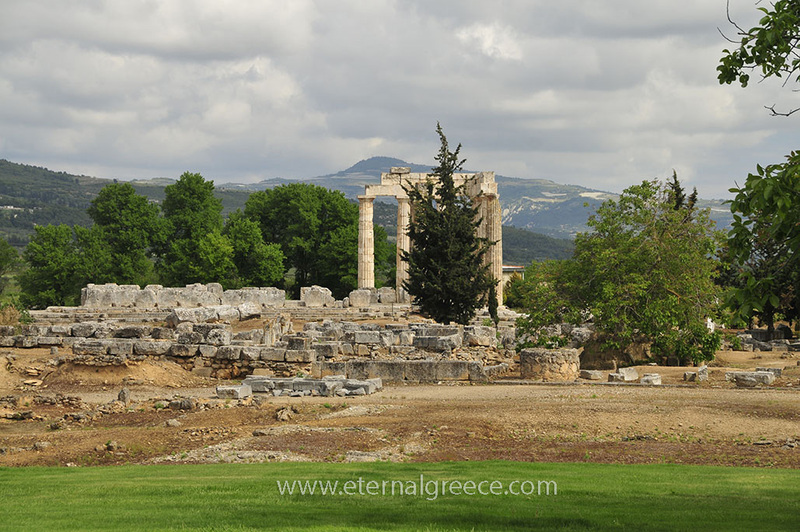 The Temple of Zeus at Ancient Nemea. When Heracles arrived at Nemea and started tracking the ferocious lion, he quickly discovered that his arrows were useless against the magnificent beast’s impenetrable golden fur, which made the arrows bounce off harmlessly. After some time the lion returned to its cave, which had two entrances. Heracles built up one of them and then entered the other where stunned the beast with his heavy club and, using his titanic strength, strangled it to death. During the fight the lion bit off one of his fingers. Others say that he shot arrows at it, eventually shooting arrows in its unprotected mouth. After slaying the lion, Hercules tried to skin it with a knife but failed. He then tried sharpening the knife with a stone and even tried with the stone itself. Finally, goddess Athena, noticing the hero’s plight, told Heracles to use one of the lion’s own claws to skin the pelt. When Heracles returned to Cleonae carrying the dead lion on his shoulders, he found Molorchus on the last of the thirty days about to sacrifice the victim to him as to a dead man, he joyously sacrificed to Saviour Zeus and brought the lion to Mycenae. King Eurystheus was both amazed and terrified and forbade Hercales ever to enter the city again, ordering him instead that he was to display the fruits of his labours outside the city gates in the future. Furthermore, Eurystheus had a large bronze jar made and half-buried in the earth, where he could hide from Heracles if need be. After that, the King sent his orders to Heracles through a herald, refusing to see the powerful hero face to face. Eurystheus warned him that the tasks set for him would become increasingly difficult. He then sent Heracles off to complete his next quest, which was to destroy the Lernaean Hydra.